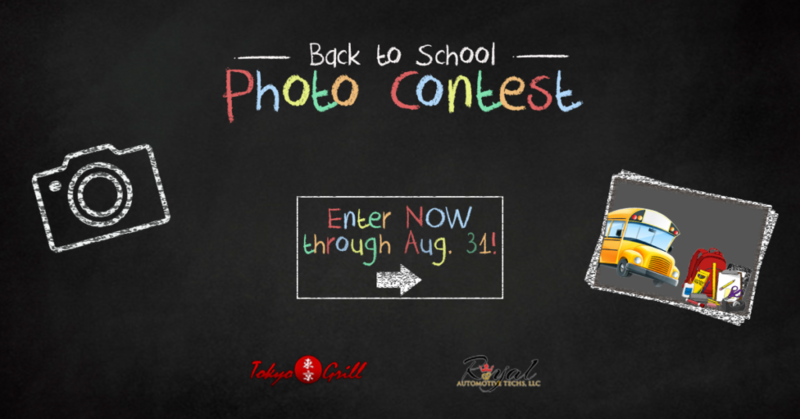 Let's see those Back-to-School photos! Vote for a chance to win a prize pack! 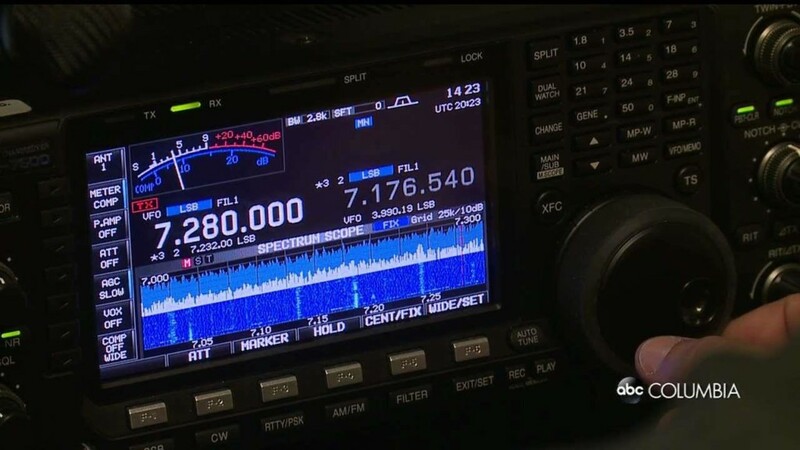 How Can Ham Radio Keep You Updated During the Total Eclipse? 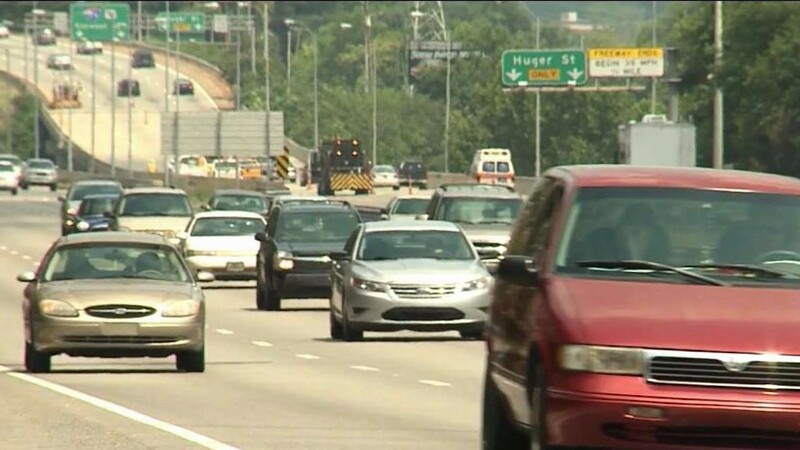 State agencies are mapping out a plan to ensure you are safe during this historical event. 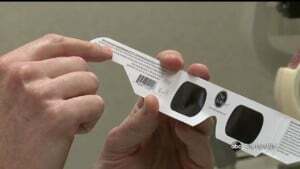 Will Solar Eclipse Myths Reappear? A look into the cultural astronomy behind a solar eclipse. 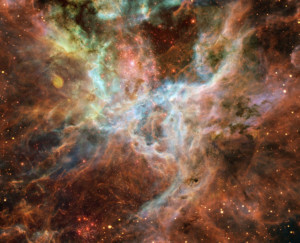 Astronomers say Columbia will experience the event for more than two minutes. Will the Skies be Clear Enough for us to See This Summer's Eclipse? 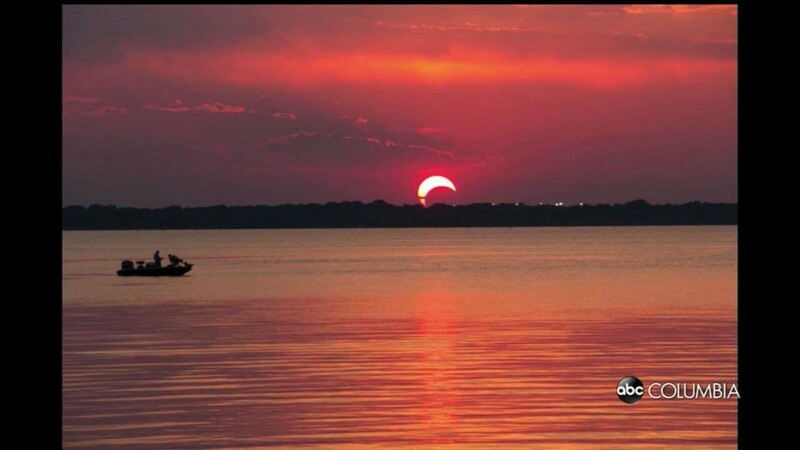 Experience the Great American Eclipse, Indian Waters Scout style! Spend the last weekend of summer at a once in a lifetime event – Great American Eclipse of 2017! Spend Three Days at Camp Barstow on the Centerline of the Eclipse! Merit Badges, STEM NOVA Activities for Cub and Boy Scouts & Venturers. Experts from the Universities of SC and VA offer Programs, Classes and conduct Experiments. Great food and Camp Barstow fun like swimming, boating, shooting sports and climbing! Register NOW! Space is limited. 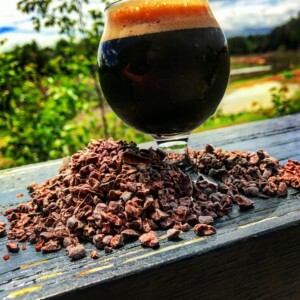 We brewed a special double stout, as black as the darkest night, and aged it with 5 lbs of cacao nibs and roasted chilis in a bourbon barrel for over 6 months. It and many others will be available at Old Mill Brewpub from August 18th – August 25th. Join us on the deck for the show. August 18-August 25 at 11pm. 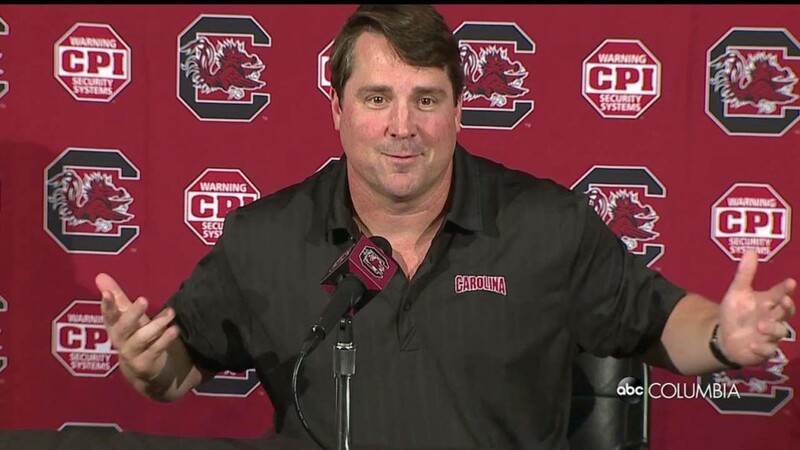 The University of South Carolina is a NASA Official Viewing Location for the total solar eclipse! 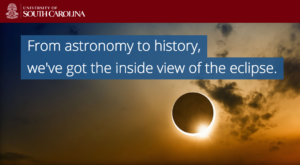 UofSC is holding a number of events to celebrate and study the eclipse because the university is home to faculty with eclipse expertise in a variety of subjects, from astronomy to history and the arts. 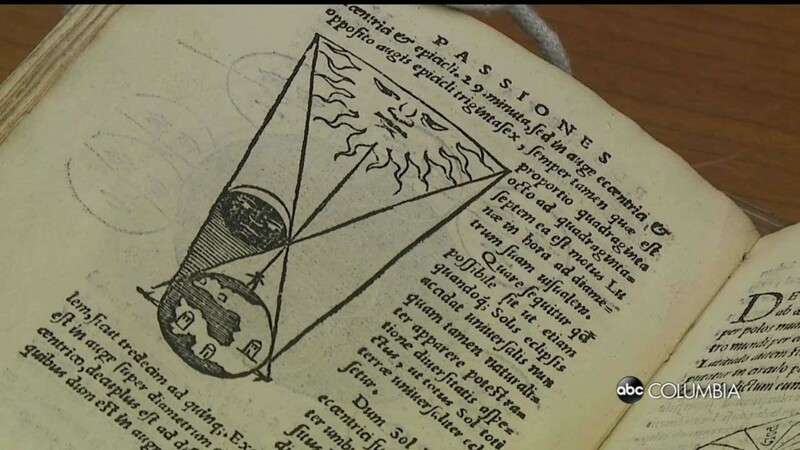 Kicking off the eclipse weekend, artifacts from The Robert B. Ariail Collection of Historical Astronomy will be on display in the Irvin Department Gallery at the Hollings Library August 17-19, 21. 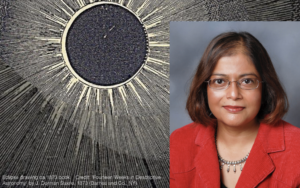 On Friday, August 18, Solar physicist Dr. Sarbani Basu, Department of Astronomy Chair at Yale University, will explore the history of solar eclipses and what humankind has learned from them in a public lecture. Attend “Solar Eclipses: the Dread and the Fascination” from 7 – 8:30 p.m. in the W.W. Hootie Johnson Performance Hall in the Darla Moore School of Business. On August 21, the Department of Physics and Astronomy is operating solar telescopes and facilitating conversation with students and others at 10 eclipse viewing stations across the USC campus. 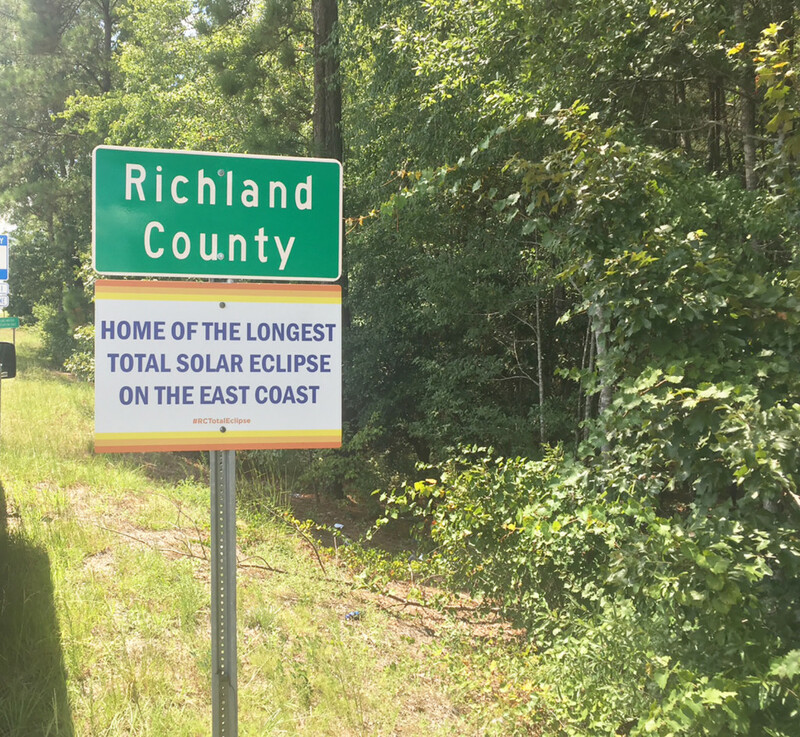 It will be a watershed moment for Columbia when the eclipse arrives and the University of South Carolina is ready to welcome the epic event. 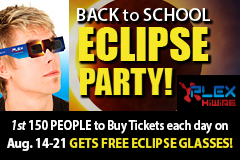 Back to School Eclipse Party at Plex HiWire is All WEEK LONG! From Monday August 14-Monday August 21st Plex HiWire will be giving away Solar Eclipse Sunglasses to the First 150 people who buys tickets every day that week! Be the First to get your Plex HiWire Solar Eclipse Sunglasses and have Fun at Plex HiWire before the Eclipse! We will also be broadcasting the Eclipse Monday August 21st! 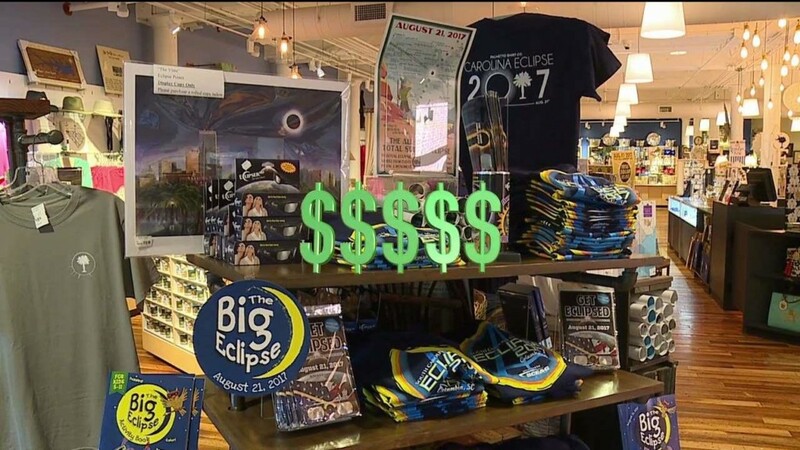 Weekend tickets do not include museum admission on the day of the solar eclipse. 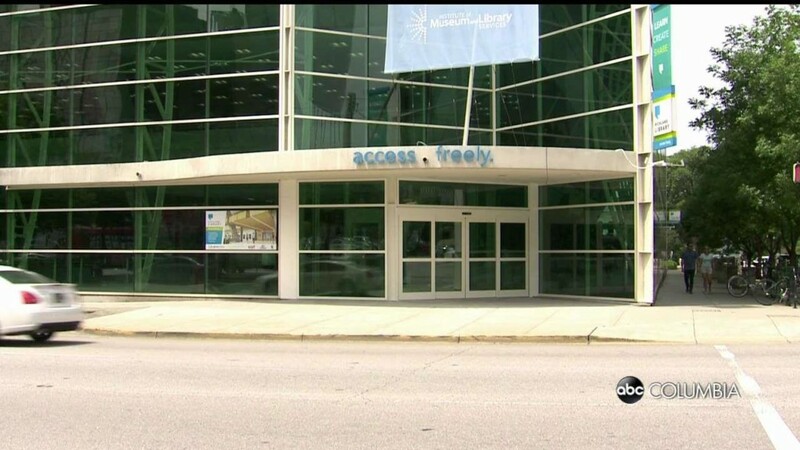 General admission to 4 floors of permanent and changing exhibit galleries featuring South Carolina art, science & tech, satural history and cultural history. 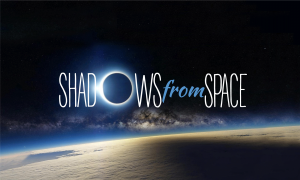 Access to a special Planetarium Eclipse Show, Shadows from Space. Access to the Robert B. Ariail Telescope Gallery and Boeing Observatory. TICKET PRICING: Each ticket is valid for ONE DAY of museum admission. If you wish to attend all 3 weekend days, you will need to purchase tickets for each day. Tickets for the general public. 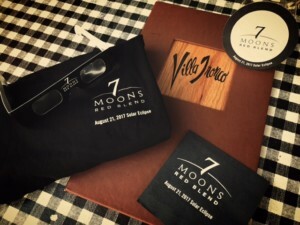 Villa Tronco will be featuring 7 Moons Red Blend Wine, Blue Moon Beer, half moon ravioli, and over the moon desserts! We will be kicking things off with our Eclipse Specials for lunch and dinner on both Friday August 18th and Saturday August 19th. These specials will also be available for lunch and dinner on Monday August 21st, as well as live music performances by Doug and Bunny Williams indoors and Vicky Saye Henderson & Kevin Bush outdoors from 6 to 9 PM. Eclipse viewing glasses will also be available. 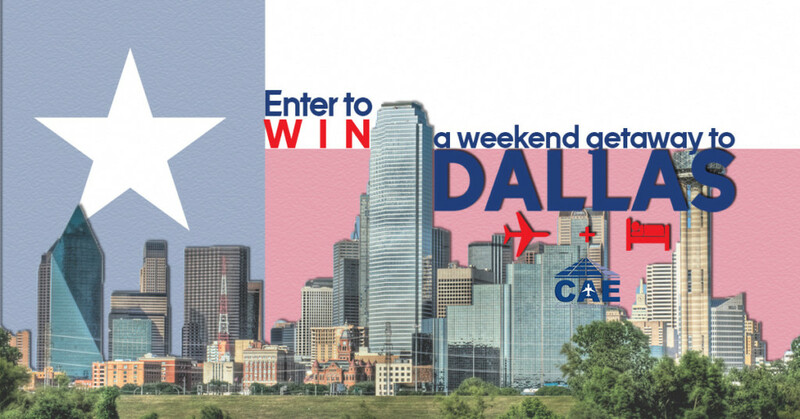 Come join us for a weekend full of fun, festivities, and great food! Reservations are recommended. 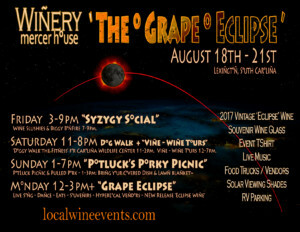 The Grape Eclipse” 4 Day Weekend 18-21 Aug 2017 – A Gathering of Wine and Sun Lovers! > $10 Entry – Enjoy $5 Wine Slushies. 11am-8pm > Bring your Dog along for a 1 mile journey through the vineyard and help raise money to support the Carolina Wildlife Center. $10 Entry. ‘Vine & Wine’ Tours are a wonderful way to enjoy great wines and learn about the place where they were born~ $20 per person (max. 4 per ride) on a guided tour with our electric wine cart. 15 minute tours will run from 12pm – 6pm. Bring a covered dish and share wonderful food, wine and fellowship. A Gathering of Wine and Shadow Lovers! Join us for Food, Jazz, Wine & “The Moon Shadow”!!! Souvenir Wine Glass $10 on site. 1L 2017 ‘Eclipse’ Wine bottled in Miron Glass – $25 on site. 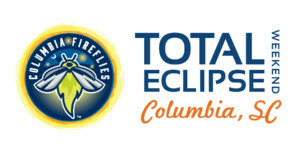 Celebrate Total Eclipse Weekend with the Fireflies as they take on the Rome Braves on Friday, August 18 at 7:05pm at Spirit Communications Park. There will be post-game fireworks! Saturday, August 19 at 7:05pm at Spirit Communications Park. The Fireflies are will be hosting NASA Night and celebrating Charles Bolden’s birthday! There are also post-game fireworks! Celebrate Total Eclipse Weekend with the Fireflies as they take on the Rome Braves on Sunday, August 20, 2017 at 5:05pm at Spirit Communications Park. The Fireflies are hosting a Future Scholar 529 Splash Sunday where the Fireflies firetruck will be out cooling fans off during the game! Stop in Friday through Sunday and save 20% on all regular priced items including designer handbags and accessories. This event will be handing out free eclipse glasses to guests courtesy of the City of Columbia, S.C.! Available on event date and time only. 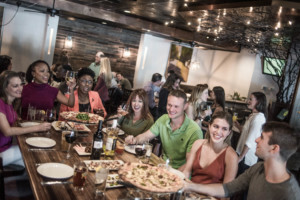 Located at Revente and Sid & Nancy's in Columbia, S.C.
Enlighten your brain with hands on activities ranging from building your own space craft to the science of beer, speakers, photographs, tasting foods, listening to music and moving your heavenly body. 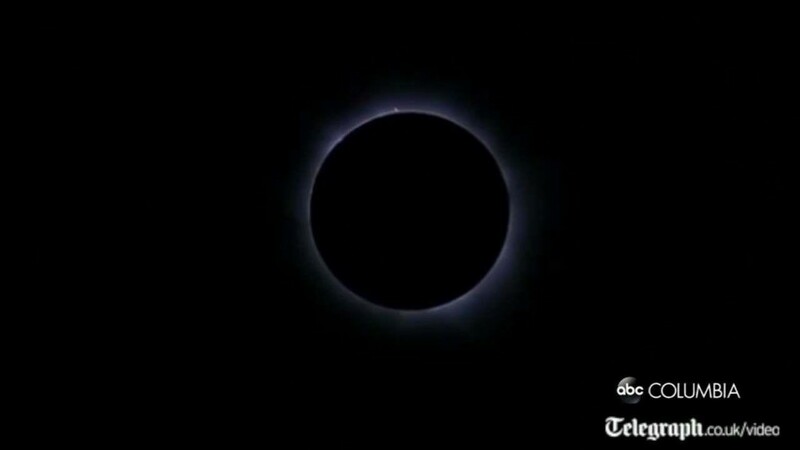 A total experience while experiencing totality. Engage with your family, community, and humanity through this very scientific yet human event all throughout different venues in our historic downtown- that last saw a total eclipse in 1900. 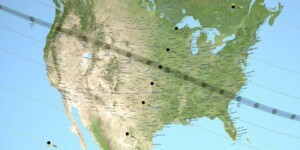 All leading up to the Experience of the eclipse at 2:40 P.M. on August 21st. The last eclipse was in 1900 and there won’t be another one until 2078. A once in a lifetime event for the entire family. Janet Ivey, PBS acclaimed Janet’s Planet host, will lead us through the Eclipse along with 3 skilled and trained state winning teachers of the year and one NASA engineer. 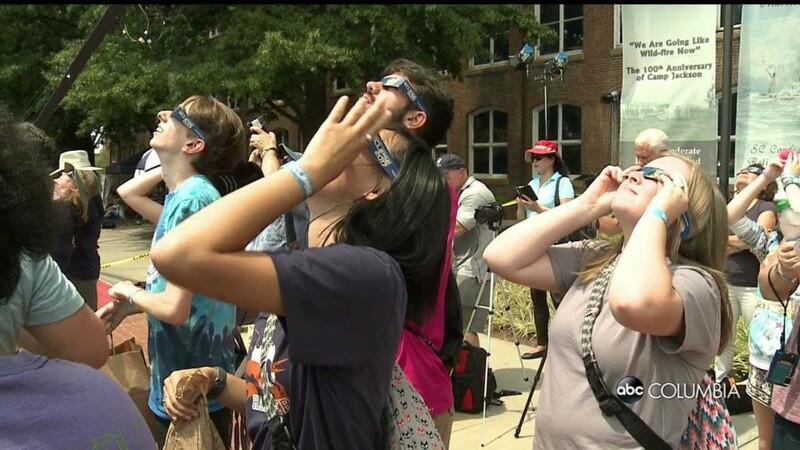 With these experts on hand, Newberry will be the best viewing location for this once in a lifetime event. This event will be handing out free eclipse glasses to guests courtesy of the City of Columbia, S.C.! Available on event date and time only.Located at the City of Newberry, S.C., hosted by the City of Newberry and Newberry Opera House. 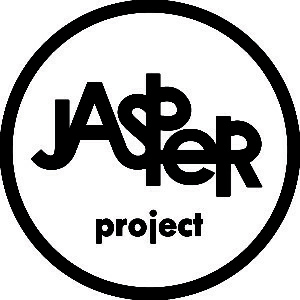 The Jasper Project presents Syzygy: The Solar Eclipse Plays – premieres of six 10-minute plays written by six SC playwrights to commemorate the 2017 Total Solar Eclipse in Columbia, SC. Playwrights include Jon Tuttle and Cindy Turner, Nicola Waldron, Chad Henderson, Terry Roueche, LaSharn Hopkins, and Julia Vargas. There will be two performances of the plays at 7 pm and at 10 pm on Thursday, August 17th, with a reception for attendees of both performances from 9 – 10 pm in the Tapp’s Gallery space. Playwrights will be available for Q and A during the reception. The scripts, along with original poetry from the Syzygy Invitational Poetry Reading, sponsored by the Jasper Project, will be bound and sold in a commemorative publication. 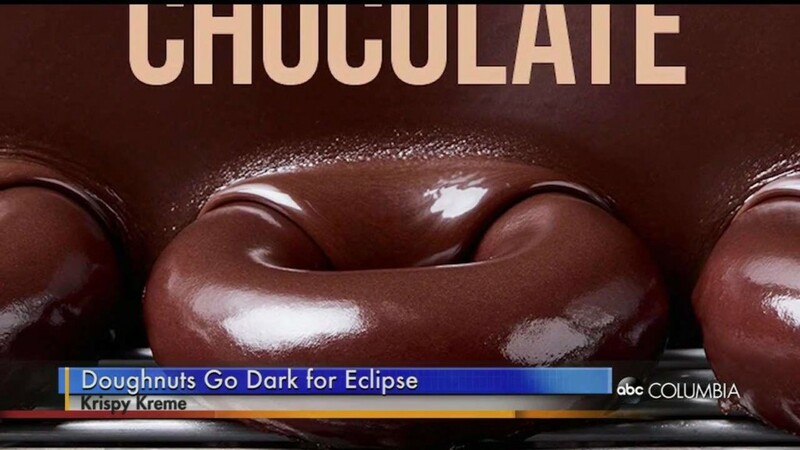 Looking for ways to cool down during the Total Eclipse Weekend? Join Historic Columbia for their third annual Historic Water Balloon Battle from 5:30 – 7 p.m. on Friday, Aug. 18. Using water balloons, guests will break into teams to learn about military tactics through history and battle on the grounds of the Robert Mills House & Gardens. After the water battle, relax with drinks and light appetizers on the grounds of the historic site. Tickets are $15 for members and $20 for non-members. Attendees must be 21 years of age or older. Visit historiccolumbia.org to purchase tickets. 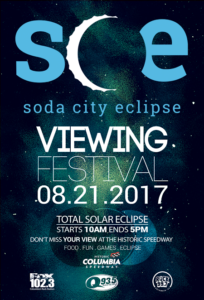 This event will be handing out free eclipse glasses to guests courtesy of the City of Columbia, S.C.! Available on event date and time only. Located at the Robert Mills House & Gardens in Columbia, S.C., hosted by Historic Columbia. Come and enjoy some great jazz from local artists “Don and Sara” and the “Mean Gene Swing Machine” (formerly Blythewood Jazz Orchestra). This is a free event however it will also be fundraiser for the Doko Meadows Park Foundation. Suggested donations are $1 for children, $2 for adults, collected at the gate. All donations will go to helping improve your beautiful Doko Meadows Park! This event will be handing out free eclipse glasses to guests courtesy of the City of Columbia, S.C.! Available on event date and time only. Located at Doko Meadows Park, Palmetto Citizens Amphitheater in Blythewood, S.C., hosted by Blythewood Chamber-Cowork-Visitors Center. Public Lecture at USC - "Solar Eclipse: the Dread and the Fascination"
A free public lecture by Dr. Sarbani Basu, solar physicist and chair of the Yale Department of Astronomy. Abstract: There is an almost five thousand year history of solar eclipses. The occurrence of solar eclipses, with the day turning dark, have been hailed as portents of the future. Much later, eclipses began to be used to study the outer layers of the Sun. A solar eclipse was also used as a means to carry out one of the first tests of General Relativity. 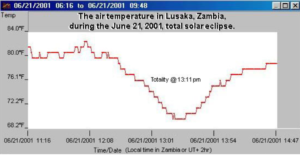 Even today eclipses fascinate people, and although we can create eclipses within a telescope (using a coronagraph), scientists still flock to eclipse sites. The eclipse on August 21 will be visible over a large part of the US and many people — tourists, educators, and scientists — are trying their best to be where the total eclipse will be visible. 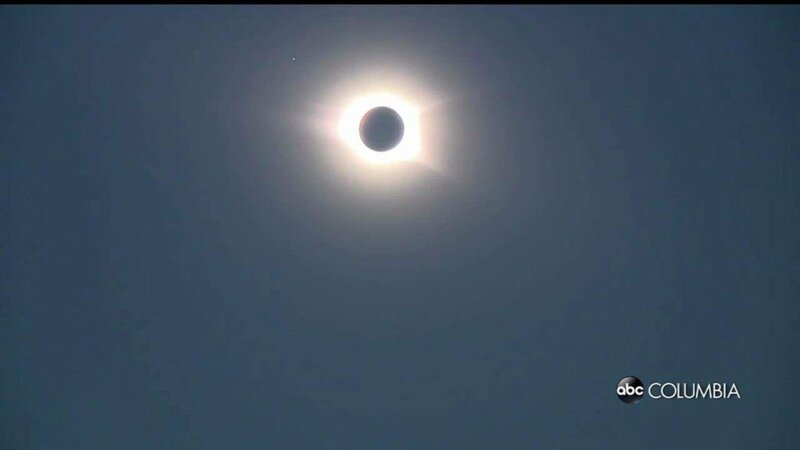 This makes this a good occasion to look back to other eclipses and put the upcoming one in context. This talk will therefore explore the history of solar eclipses and make a tally of what humankind has learned from them. This event will be held on the USC campus at the W.W. Hootie Johnson Performance Hall (Room #101) in the Darla Moore School of Business (1014 Greene Street) and will be free and open to the public. Reservations are not needed, but seating will be on a first come, first served basis. Dr. Basu’s presentation will be given at a level that is accessible to a broad public audience. This event will be handing out free eclipse glasses to guests courtesy of the City of Columbia, S.C.! Available on event date and time only. Located at the University of South Carolina – W.W. Hootie Johnson Performance Hall in the Darla Moore School of Business (Room #101) in Columbia, S.C.
Art, drink, and be happy! Enjoy beer tastings of Columbia’s Eclipse Pale Ale, on August 18 7-119m. A collaboration brew from Catawba Brewing Company and The Whig . Grab food from Real Mexico, Wurst Wagen, and Bone-In BBQ for a quick bite with your brew. 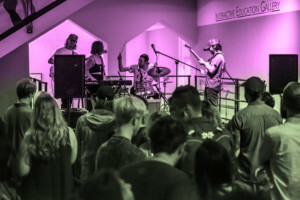 Live music from Tomboi, Fall of an Empire, and Josh Roberts and the Hinges, plus Unique Perspective tours, eclipse-themed art-making activities, and scavenger hunts inspired by works in the exhibitions. Community partners Richland Library, USC’s Ink & Paper, and more will be on hand with upcycling-inspired DIY activities. Complimentary eclipse glasses will be available to attendees while supplies last. $9 / $5 for members. Presented by McDaniels Subaru and Cyberwoven. Sponsored by The Whig, WXRY, Free Times, and Bob Rice Realty. Want to get in free? Either join or renew your membership that night or volunteer part-time. 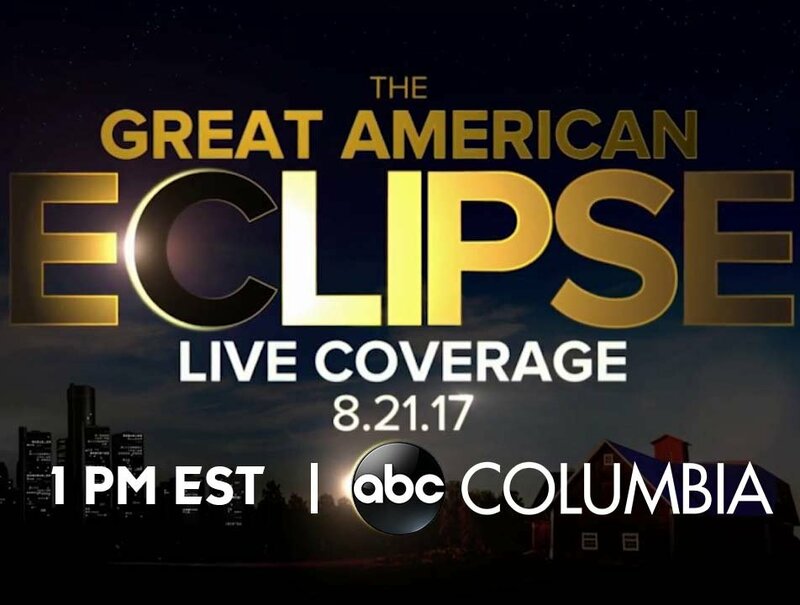 This event will be handing out free eclipse glasses to guests courtesy of the City of Columbia, S.C.! Available on event date and time only. 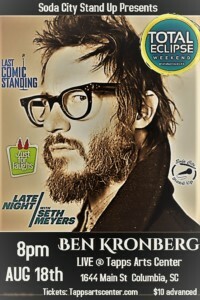 Located at the Columbia Museum of Art in Columbia, S.C.
On Friday, August 18th Soda City Stand Up and Tapps Arts Center are proud to bring Comedian Ben Kronberg to the Capital City as part of the Third Friday Comedy Series. 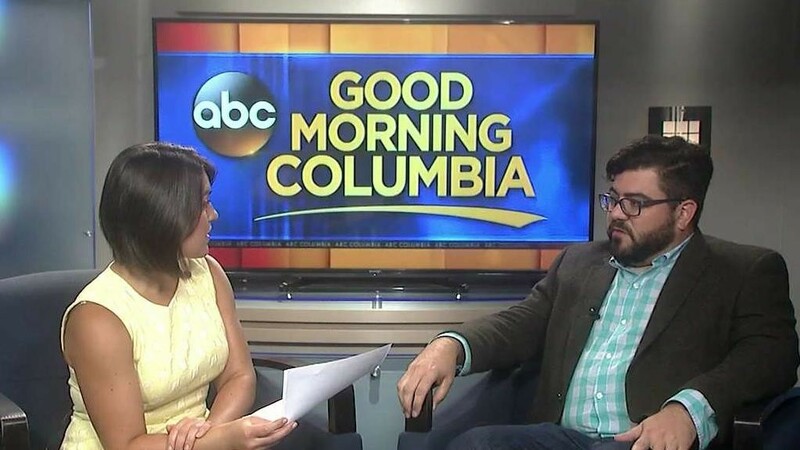 Ben is a nationally touring comedian that has been seen on Last Comic Standing, Comedy Central, Last Call w/ Carson Daily, Jimmy Kimmel and John Oliver’s Stand Up Special. Ben has toured all over the world including shows in South Korea. He will be joined by local comedians John Gibson and Topher Riddle as part of this event. Tickets will be $10 in advance and $12 day of show. Tickets available: tappsartscenter.com. 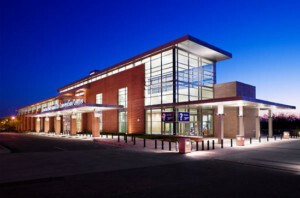 Tapps Arts Center is located at 1644 Main Street in the heart of downtown Columbia. Doors open at 730pm and the show starts at 830pm. This event will be handing out free eclipse glasses to guests courtesy of the City of Columbia, S.C.! Available on event date and time only. Located at Tapp’s Arts Center in Columbia, S.C., hosted by Soda City Standup. 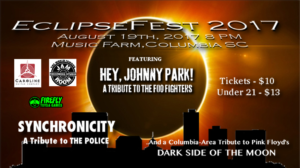 On Saturday, August 19th, at 8 pm The Music Farm in Columbia will host ECLIPSEFEST 2017, a night of tributes to your favorite rock and roll bands! For just $10, you can experience the best tribute acts Columbia has to offer. The night starts with Synchronicity, a note perfect tribute to The Police. Following that, Hey Johnny Park! will storm the stage and rock hits from the twenty plus years of The Foo Fighters. To close the night, these two groups will be joined by some of Columbia’s most talented musicians to deliver a performance suiting the occasion – a complete performance of Pink Floyd’s groundbreaking album Dark Side of the Moon. What better way to prepare for a total solar eclipse? EclipseFest 2017 is sponsored in part by Caroline Guitar Company, The Jam Room Recording Studio, and Firefly Toys and Games. Tickets will be available to the public starting May 6th via TicketFly and the Music Farm box office. Make your plans NOW to attend an unforgettable night of live music, in celebration of a truly amazing event – ECLIPSEFEST 2017! 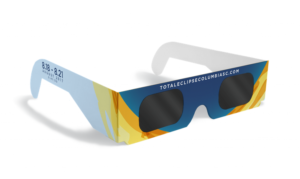 This event will be handing out free eclipse glasses to guests courtesy of the City of Columbia, S.C.! Available on event date and time only. Located at Music Farm in Columbia, S.C., hosted by Alter Ego Productions. 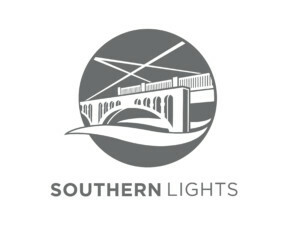 August 19 @ 7:30-10pmSouthern Lights, an art light installation set to span the Congaree River between the Blossom and Gervais Street bridges by Chris Robinson, will offer viewers a contemplative experience, meant to be viewed again and again. Join us as at First Night Southern Lights for the official launch of the installation. Robinson will speak about Southern Lights, his other laser installations and his career spent exploring the connections of art and science. Attendees can take a guided tour to the river’s edge to experience Southern Lights.Southern Lights is an installation made of blue and green lasers, and offers an innovative approach to public art by celebrating and highlighting public infrastructure uniquely. Because of its large scale and the possibility to run for up to a decade, Southern Light is the only installation of its kind in the country. First Night Southern Lights is hosted by the Congaree Vista Guild. 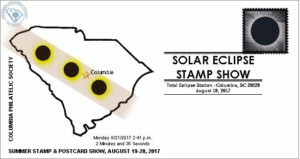 Tapp’s Arts Center is pleased to announce our participation in Columbia’s Total Solar Eclipse festivities! 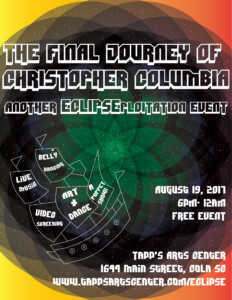 Join us August 19th for The Final Journey of Christopher Columbia: Another ECLIPSEploitation Event. From 6pm to 12am, Tapp’s will host a free carnival commemorating the wildly problematic exploits of an historic hustler. From puppet shows to belly dancing, to an indie rock immersive celestial concert, Tapp’s will be transformed into a spectacular experience loosely generated around the core story of Christopher Columbus, a shipwreck, and the use of an eclipse to machinate advantage. Merging the story of Christopher Columbus’s fourth and final journey to the new world, the origin story of the name Columbia, and our current celestial celebration, Tapp’s has curated an evening of entertainment and reflection on the multifaceted social and political history of Columbia, SC. 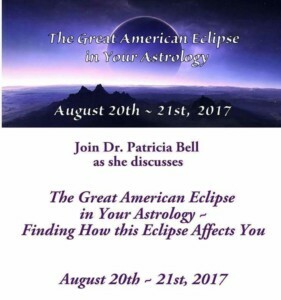 Free Celebrate Eclipse Weekend! Park Ranger guided sunset walks along the historic Columbia Canal, trying for live remote, eclipse information and glasses distribution. Join us at the 12,000 Year History Park for solar eclipse and historic walking tours as a “dress rehearsal” to the total solar eclipse. Learn basic facts about the causes of the solar eclipse as well as what to expect and how to prepare for the event. 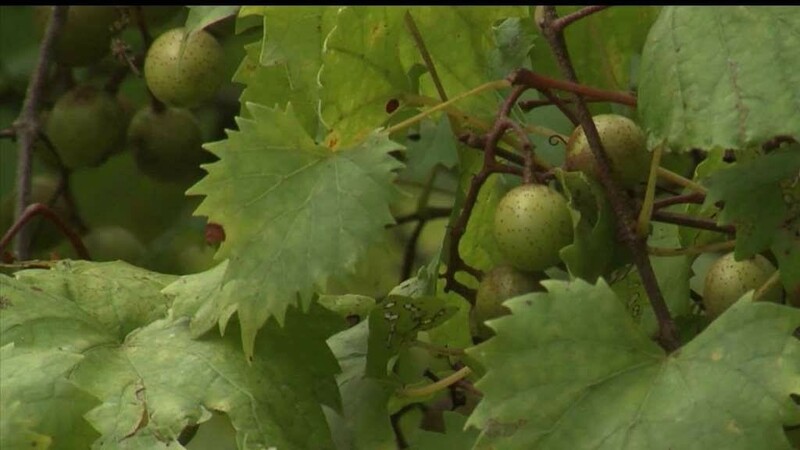 We will also have information on the cultural and natural resources of the park including an American Civil War battle, an 18th century colonial fort and trading post, and Native American sites and artifacts. Free pair of eclipse glasses to the first 100 people. Located along Timmerman Trail, one of the region’s newest walking, jogging, cycling and hiking trails, adjacent to the Congaree River. 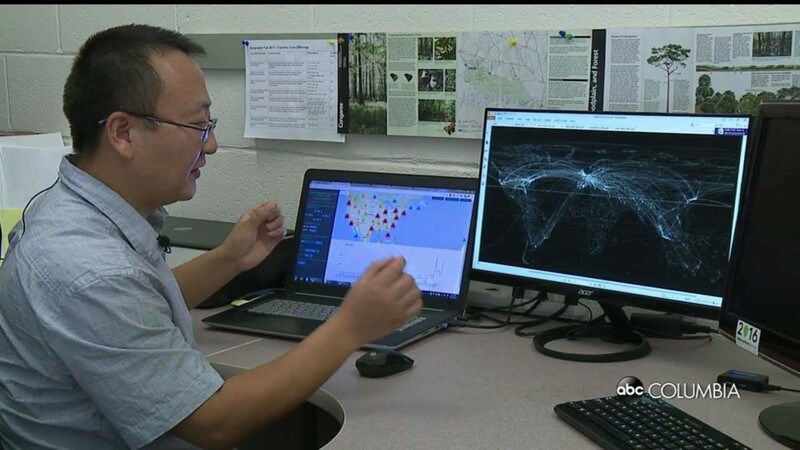 Park at the Cayce Tennis and Fitness Center in Cayce, S.C.
August 19 @ 11am-12pm Geocaching is a technical scavenger hunt and is a growing sport worldwide. People hide containers called caches of varying sizes and use GPS coordinates to locate the cache then sign a log located in the cache. The larger ones hold prizes (“swag”) that could be anything from toys to trackable pieces that are followed by their owner via the assigned number and travel all over the world. You can refer to the website, www.geocaching.com, for more information. August 19 @ 10:30am-12pm Solar-brate with us. Join Richland Library for a morning of music, fun and prizes for the whole family as we celebrate the end of summer during the Solar Eclipse Weekend! 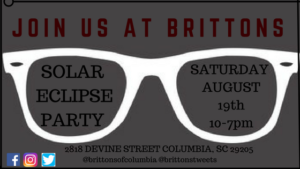 Cosmic Solar Eclipse Pre-Party at Brittons on Devine St.
Join us Saturday, August 19th, for our Cosmic Solar Eclipse Pre-Party! Donate a pair of glasses at Brittons for the Lions Club Sight Program and receive your certified Eclipse viewing glasses and 20% off of one regular price item! Hosted by Brittons of Columbia, boutique retail shop on Devine Street offering men’s and women’s clothing, bow ties and more. 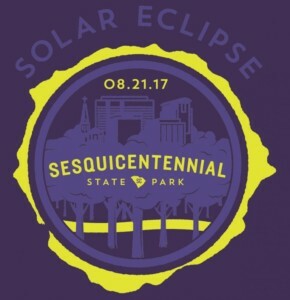 August 19 @ 10:00 am - 11:00 am Join us at Sesquicentennial State Park to learn more about this once in a lifetime event happening right here in South Carolina on August 21! 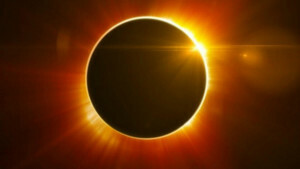 We’ll discuss why solar eclipses occur and how to view them safely as well as make a couple fun, easy take home crafts! Pre-registration is required and space is limited. Adults must accompany children 15 and under. For more information or to register call (803) 788-2706 or email sesqui@scprt.com. Step Up with Purpose is kicking off the “Total Eclipse” Weekend with our first annual Family Fun Day & Women’s Empowerment Expo on August 19th from 9 am to 1 pm. 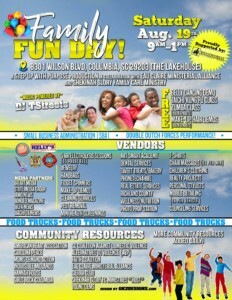 Bring the kids for tons of free activities like face painting, arts & crafts, games, and FREE inflatables. We didn’t forget that grown-ups, we will have over 50 merchandise/service vendors to include local food trucks offering food to satisfy everyone’s palette. But we didn’t stop there, several local nonprofits and community organizations will be on site sharing invaluable community resources and information. We will offer live musical and dance performances plus free Zumba and Tai Chi classes for the general public. We have a fun-filled event and look forward to seeing you on Saturday, August 19th! August 20 at 7:30pm-11:40pm We will be hosting an old fashion Drive-In Movie night at the Historic Columbia Speedway festival grounds where we will show an educational short on the history of eclipses followed by “Escape from Planet Earth”. $25 per car. Experience a taste of “Cool” Columbia and kick off the solar celebration with a 5K run and 1-mile fun walk through Saluda Shoals Park! Brought to you by Saluda Shoals Foundation and Fleet Feet Sports. Cool off during the run in misting stations and finish up with the Summer’s End Celebration by enjoying local food, live music and craft beers. The Going Commando Band will be playing from 6:00pm-9:00pm. Wolf Pizza Company and Can’t Quit Smokin’ BBQ will be on site for those wanting to purchase some local cuisine. Proceeds benefit the Saluda Shoals Foundation. All ages welcome. If you don’t want to walk or run you can still join the fun for $5 per person. 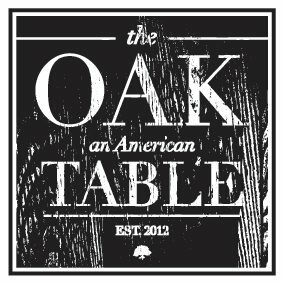 Join Executive Chef Todd Woods of The Oak Table and Chef Frank Bradley of Bourbon for a feast of 5 dishes prepared using our local fresh seasonal bounty. Dine in front of the State House on a meal inspired by the Solar Eclipse. Ticket includes 5 courses. Cash bar or BYOB. August 20 @ 6pm-9pm. August 20 7pm-11:59pm One of the Southeast’s most vibrant mid-sized cities, Columbia, S.C., is home to the longest total solar eclipse for a metro area on the East Coast and will host Total Eclipse Weekend Columbia, S.C., a long weekend of more than 100 eclipse-related festivals and events, from Aug. 18 to 21, 2017. 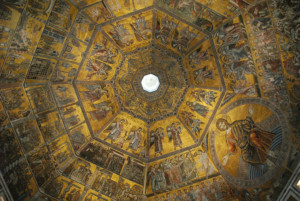 August 20 @ 3pm-4:30pm In this lecture, Dr. Anna Swartwood House, assistant professor of Renaissance art history at the University of South Carolina, explores depictions of eclipses and other celestial events in Renaissance art. Free with membership or admission. Located at Columbia Museum of Art. 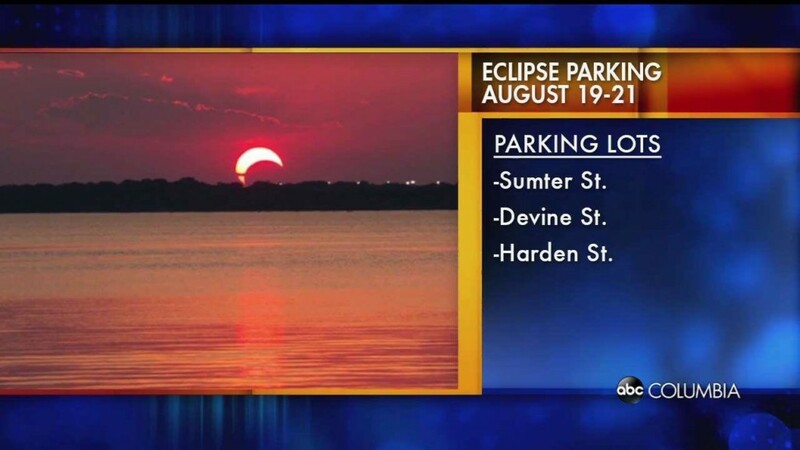 As summer draws to a close this year, don’t miss your chance to experience the longest total eclipse on the East Coast right here in Columbia! 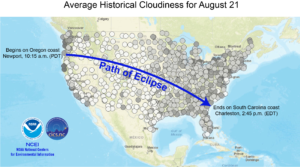 Not only are we lucky enough to be in what experts call, the “path of totality”– an alleyway of prime eclipse viewing stretching across the United States, but we’re the last and longest stop on the path! 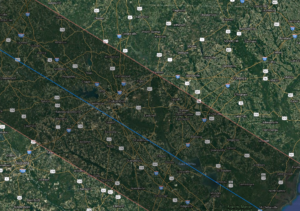 At 2:41pm, Monday August 21, millions will gather in the Greater Columbia area to witness up to 2 minutes and 36 seconds of total solar eclipse. But before all that excitement and history-making, why not commemorate Total Eclipse Weekend Columbia, SC with a true cinematic classic at your favorite movie theatre in the heart of the action? Join us on the night before the Eclipse, Sunday, August 20th at 6:00pm for a special one-time screening of Stanley Kubrick’s cosmological opus, 2001: A Space Odyssey! Visit the USC flagship campus in the heart of Columbia for a series of short talks from USC faculty and visiting scholars. Learn about the role of eclipses in science and society and how eclipses have factored in myths and legends throughout history. 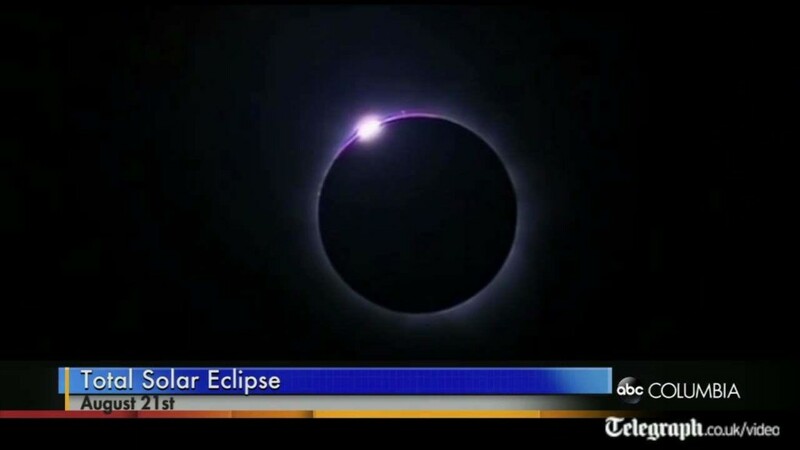 Experts will also speak about the tumultuous sun and share their experiences of past eclipses around the world. Each mini-lecture will be ~30 minutes in length, and presented at a level accessible to a broad public audience. 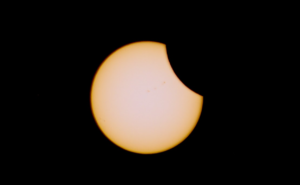 For more details about location, speakers, and access visit the USC eclipse homepage (http://sc.edu/eclipse). Please join us in Amoco Hall (Swearingen Engineering Center Room #1C01) on Sunday, August 20 at 301 Main Street beginning at 2:00 pm. These mini-lectures are free and open to the public. A complete list of speakers, topics, and times can be found at http://www.physics.sc.edu/eclipse-experts-usc-myth-history-and-science. 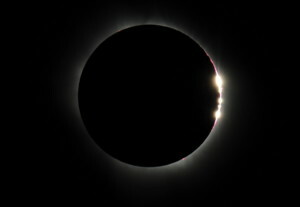 For more details about location, speakers, and access, visit the USC eclipse homepage (http://sc.edu/eclipse). Parking is available near Swearingen Engineering Center, City of Columbia parking meters are free on Sunday afternoons. Free show outside of Music Farm Columbia & Tin Roof! August 20 @ 12pm-3pm Get ready for the solar eclipse with celestial art! The whole family is invited to make galaxy prints during this drop-in studio program. Free. 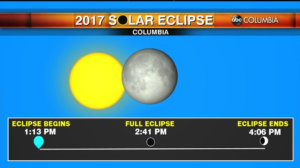 This event will be handing out free eclipse glasses to guests courtesy of the City of Columbia, S.C.! Available on event date and time only. Located at the Columbia Museum of Art in Columbia, S.C.
Join us, Urban Shamanics, on Sunday afternoon before the Eclipse Event with Dr.Patricia Bell, of Lily Dale, NY. She will give you the inside info on how the event will rearrange your personal life Astrology. Located at the American Legion in Columbia, S.C., hosted by Urban Shamanics. August 20 @ 2-5pm. 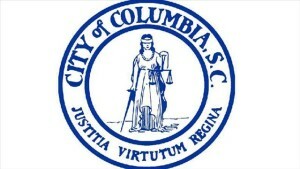 Visit Columbia, SC for the Summer Stamp and Postcard Show! 13 professional dealers from around the southeast region will be on site to offer great deals on US and Worldwide collections, philatelic covers and items of postal history. The postcard dealers have a wide variety of materials to peak everyone’s interest. 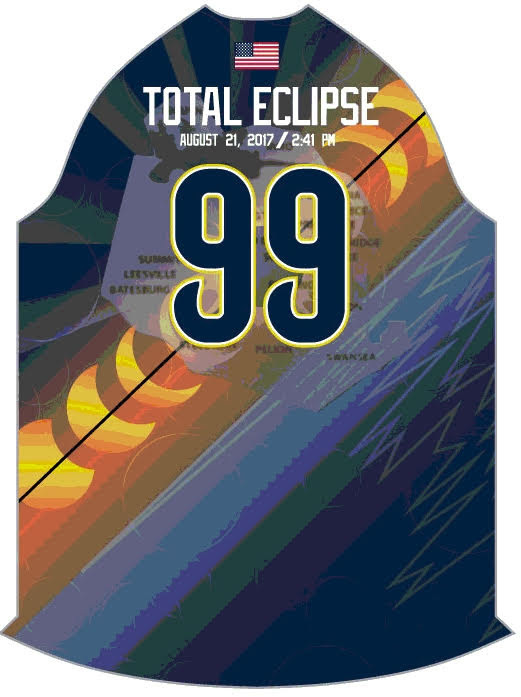 Plus, the theme for the show will be the Total Solar Eclipse, with a US stamped envelope commemorating the event! August 20 Saturday 10 am – 5 pm, Sunday 10 am – 4 pm. Join Random Tap for the viewing of the total solar eclipse. Bring your lawn chairs and the family for the viewing. 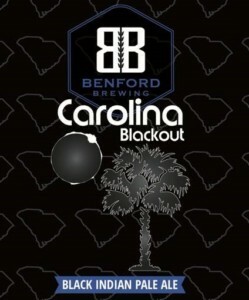 Enjoy a special Brewing of Carolina Blackout beer by Benford Brewing. Enjoy a cold one during this once in a lifetime event, and buy a beer in a commemorative can to remember the eclipse. Best viewing area! We will be opening at 10am, and we will have a food truck as well as live music by Blues Deluxe Duo from 11am-2pm. The other stores at Shoppes of Pontiac will be open as well. We are featuring Benford Brewing’s Carolina Eclipse in commemorative cans, a special Eclipse collaboration beer from The Whig and Catawba Brewing on tap and “Celestial” wine by the bottle. 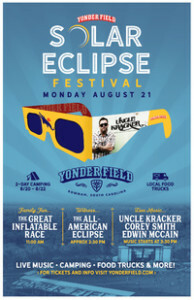 Yonder Field has announced that a family-oriented event, the Solar Eclipse Festival, will be the first official festival at the new outdoor event space in Bowman, SC on Monday, August 21. 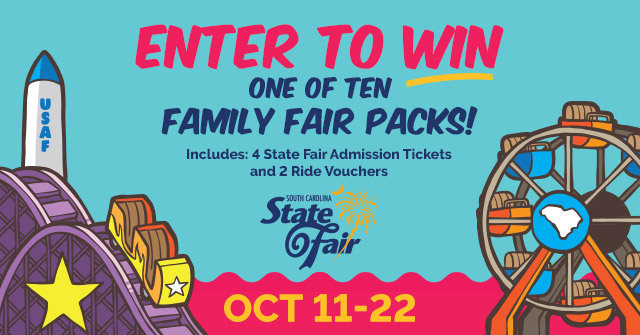 This full day of family fun includes THE GREAT INFLATABLE RACE, a giant inflatable obstacle course, music featuring Uncle Kracker as well as South Carolina’s own EDWIN McCAIN and COREY SMITH, and a viewing of E.T. the Extra-Terresterial on the drive-in movie screen. The Great Inflatable Race includes team competitions, a children’s competition, and an opportunity for kids of all ages to join in during “Open Play.” The team and children’s competitions will include fantastic prizes for the winners as well as costume contests for both teams and kids. Guests will have the opportunity to camp overnight on Sunday, August 20 starting at 4pm and may stay through 10am on Tuesday, August 22. Food and beverages will be available for purchase throughout the event as well as in the campground area. G/A Lawn $25 – this includes all music and the movie. Car Camping $75 – 2-Day Car Camping Pass. This price also includes the movie. RV Camping $150 – 2-Day RV Camping Pass. This price also includes the movie. Open Play – $25 single ticket – this is for Open Play only from 1-2pm and 3-5pm. Located at Yonder Field in Bowman, S.C. 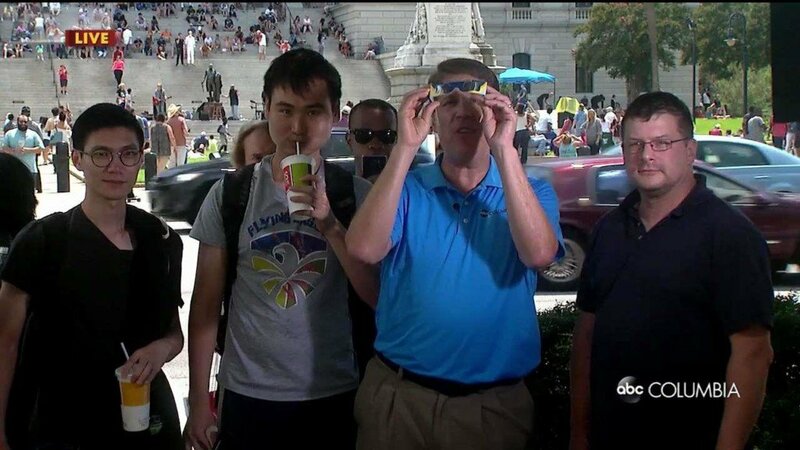 Spending your eclipse day downtown? Finlay Park is in easy walking distance, with perfect lawn space to spread your blanket or set up your chair. The Vista Greenway provides a link along an abandoned railway tunnel to the park from Lady Street. The Vista Greenway also extends to the Cottontown Neighborhood beside the Elmwood Underpass. Walk or bike away from traffic! 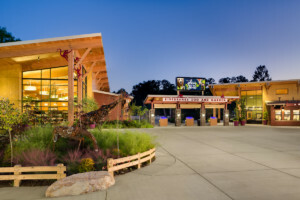 Riverbanks Zoo and Garden invites guests to experience the rarest of celestial shows at the wildest place in Columbia, SC, during the much-anticipated total solar eclipse on Monday, August 21. 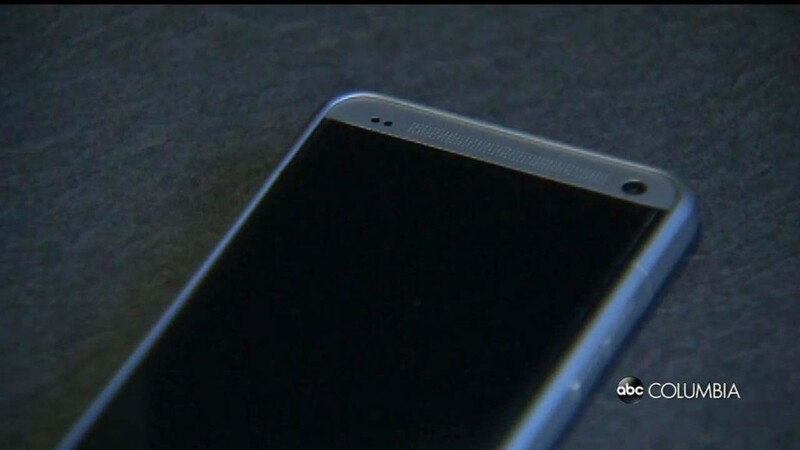 Columbia, which is in the direct path of the eclipse and considered one of the best viewing cities, is expected to go completely dark for about 2 ½ minutes at 2:41pm. And as you might imagine, many are wondering how this phenomenon will affect the Zoo’s nearly 2,000 animals. Join us for a fun filled viewing party at the Historic Columbia Speedway festival grounds. The event will include live music featuring Columbia’s Recording Artists “Syr”, food trucks, beverages, water slides, art vendors, and cool shade tents. Bring out your chairs and blankets and picnic on our 9 acre lawn and take in one of the best views in the City of this momentous occasion. The speedway is on a great line of totality. The gates will open at 10:00 am and the event will wrap early in the evening. 3,000 Parking Spaces will be free and available for festival attendees only. We have commemorative viewing glasses for the first 8,000 ticket purchasers. Ticket Prices are $10.00 for adults and $5.00 for kids 12 and under. Your ticket purchase includes your commemorative viewing glasses while they last. Where will your eclipse experience be? Come watch in the woods at Sesquicentennial State Park with us and experience this total solar eclipse in a nature setting. 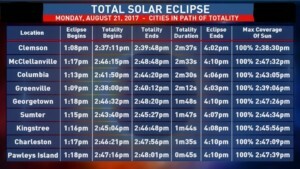 Sesqui is in the “Path of Totality” and viewers will see the total solar eclipse for over 2 minutes. See how nature reacts to this phenomenon too! We will have an information booth set up where visitors can learn basic eclipse facts, safe viewing tips and even make a fun eclipse-themed craft. Bring your solar glasses or purchase a souvenir pair from us! Other souvenirs will be available for purchase as well. We strongly recommend carpooling as we are expecting large crowds. What to Bring : Drinks, snacks, sunscreen, solar glasses and a lawn chair or blanket. 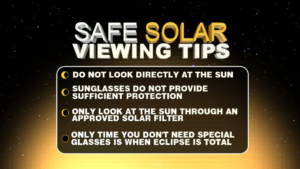 Get your solar eclipse viewing glasses early as supplies will be limited and could run out that day. 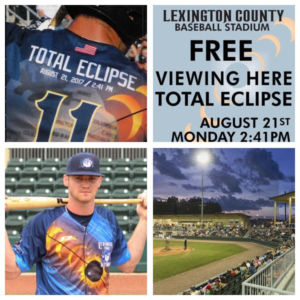 Price : Viewing Party – Free with park admission ($5/adult, $3/children 6 – 15, $3.25 SC Seniors) Eclipse Paddle – $20/person(Commemorative Eclipse Shades included) Note: Payment is due when you make the reservation. 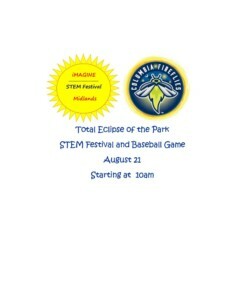 In collaboration with the Columbia Fireflies, S2TEM Centers SC and South Carolina’s Coalition for Mathematics and Science (SCCMS) are excited to present the first iMAGINE STEM Festival Midlands. Starting at 10am, visitors at Spirit Communications Park will have the opportunity to engage in activities with business, industry, and education leaders to experience how STEM (science, technology, engineering, and math) connects to the community around us. The STEM Festival will last until around 1pm and shortly thereafter the Columbia Fireflies will start their baseball game against the Rome Braves. The game will temporarily stop prior to the totality of the eclipse. 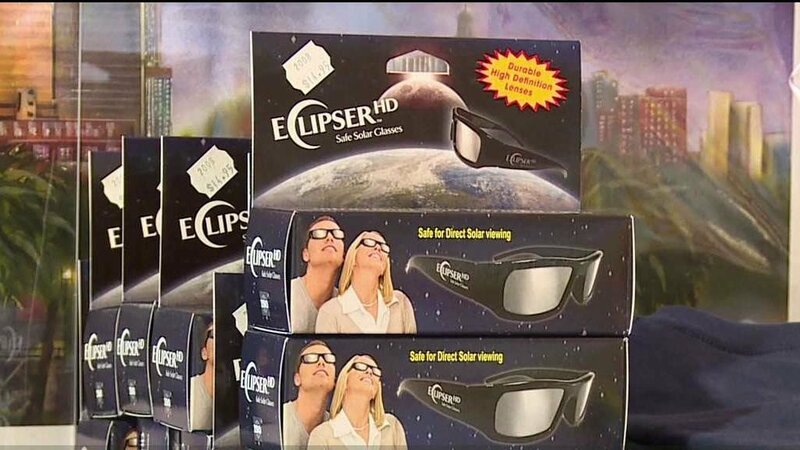 All participants will receive sun-viewing glasses for the eclipse. Only those with tickets to the game will have access to the STEM Festival. Benedict College is hosting a FREE viewing of the total solar eclipse on August 21, 2017 at the Charlie W. Johnson Stadium from 11- 3 p.m. 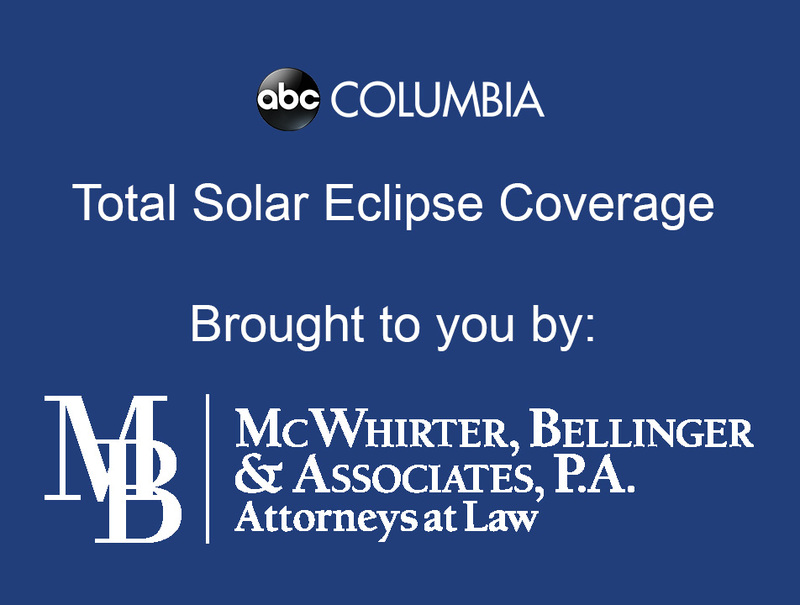 Most of the United State will only see a partial eclipse, but Columbia South Carolina, falls directly within the eclipse’s region of totality. *Benedict’s spacious Charlie W. Johnson Stadium offers the perfect place to view this rare sighting while enjoying the solar games for kids of all ages, live music, concessions with family and friends. FREE solar eclipse glasses are available for the first 6,000 guests. *Keep an eye on www.benedict.edu for event and inclement weather updates. 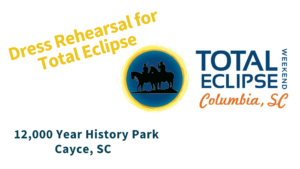 What: Benedict College Total Solar Eclipse Experience: Featuring the Solar Games –A Total Eclipse Viewing event to include educational seminars, food, drinks, snacks, solar games for the kids of all ages and a performance by the Benedict College Marching Band of Distinction. Solar Games: 11a.m.- 1:30 p.m. 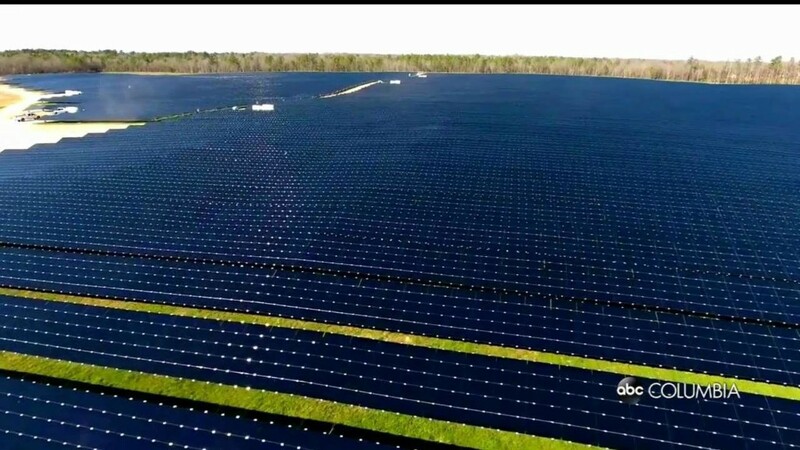 Solar Lectures: 11a.m.- 2 p.m.
Festivities end at 3 p.m.
Come experience Solar 17 at Lake Murray on Monday, August 21st! 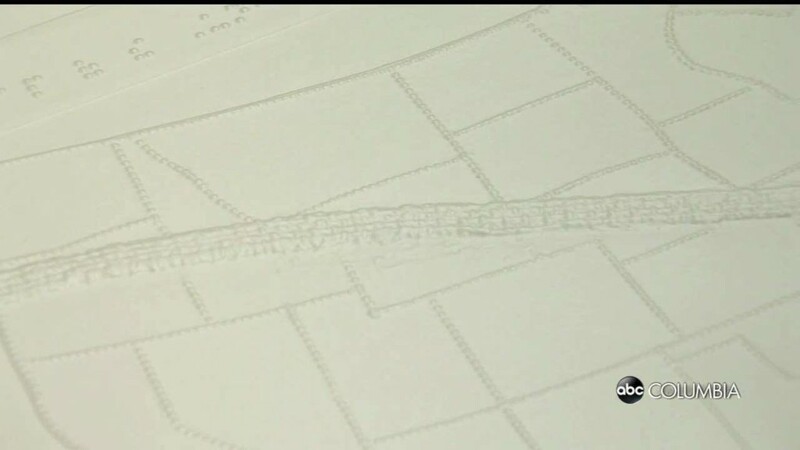 Lake Murray will have the largest viewing area! Tents will be set up at on both sides of the Lake Murray Dam (Lexington & Irmo sides). WCOS Radio will provide music and free beverages from Cheerwine. Come join the staff of the Lexington County Museum as we get ready to view the solar eclipse. The museum is partnering with the Augusta Georgia Astronomy Club to offer a historic way to enjoy the eclipse. Visitors will learn about how to view the solar eclipse and the effects of the eclipse. Members of the Augusta Astronomy Club will also be on hand to explain the science of solar eclipses and what to look out for. 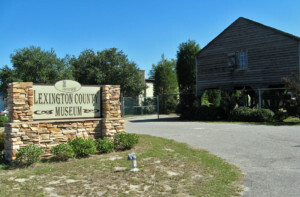 Museum staff members will be leading tours that focus on lighting and astronomical events throughout Lexington County’s history. The museum will also have a storytime for children. Call the museum at 803-359-8369 for more info. 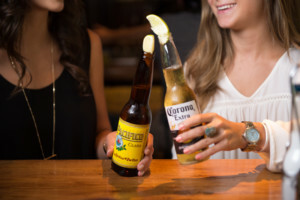 Celebrate #TotalEclipseCAE and the rare opportunity to view the sun’s Corona with *all day* drink specials – $3 Coronas + Corona Lights – at both Cantina 76 locations on Monday, August 21, 2017 11:00 a.m. – 9:30 p.m. Additional happy hour specials vary by location, 4:00 – 7:00 p.m.
Imbibe during #TotalEclipseCAE with $4 select wine by the glass all day on Monday, August 21, 2017, 11:00 a.m. – 9:30 p.m. Additional happy hour [4:00 – 7:00 p.m.] specials include $3 pints; $2 Bud Light drafts and $3 Tito’s vodka, Tanqueray gin and Larceny bourbon. We’ll have some fun eclipse-themed items on our draft list and we’ll be hosting an eclipse-themed party ALL DAY LONG! Starts at 11AM and goes until we close! Craft and Draft has an indoor draft beer bar and a safe, outdoor viewing area out back. 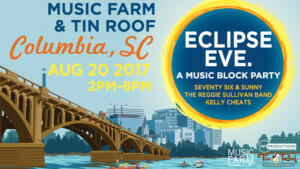 The City of West Columbia invites you to attend Solar Fest West to view the once in a lifetime solar eclipse on Monday, August 21, 2017, from 12 PM – 4 PM, at the Wyman M. “Mac” Rish Riverwalk and Amphitheater, 109 Alexander Road, West Columbia, SC. 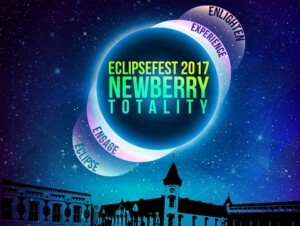 Solar Fest West will feature live music from Seventy Six and Sunny with Prettier than Matt, food trucks, a beer garden, education stations to learn more about the eclipse, Pelican SnoBalls, face painting, balloon art, cooling stations, a photo booth with a custom eclipse background, and free eclipse glasses! At 2:41 p.m. on Monday, August 21, 2017, viewers who have gathered in the Greater Columbia, S.C., area will experience the longest period of 100% total eclipse for a metro area on the entire East Coast of the United States — up to 2 minutes and 36 seconds of total darkness. Experts estimate that this total solar eclipse will be the most watched eclipse in the history of the world as we know it. Only those in the “path of totality” will have the extremely rare, awe-inspiring experience of witnessing a 100% total eclipse. Enjoy our newest love: 7 Moons Wine. It is an INCREDIBLE blend of 7 reds: syrah, merlot, petite sirah, zinfandel, cabernet sauvignon, malbec and grenache! 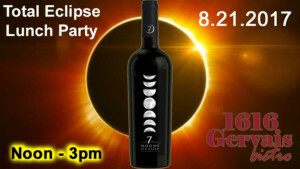 We will have Eclipse Specials pairing food and cheese plates with this luscious wine….and Eclipse glasses as well! Join us for a paddleboarding experience you’ll NEVER forget! 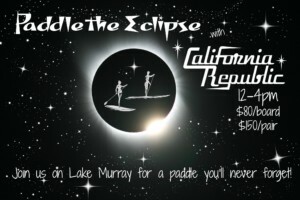 On August 21st, Lake Murray will be the PERFECT spot to view over 2 and a half minutes of total solar eclipse… and we’re going to watch it from a paddleboard! Arrive at 12 noon to have plenty of time to get set up, have your beginner lesson, and find a spot to watch phase one (called C1) which begins at 1:13pm. Totality (C2) happens at 2:41 and the whole shebang ends around 3:40. Bring a cooler with some drinks & snacks – it’ll fit perfectly on the front of the board. **Registration and upfront payment are REQUIRED to secure your board. No refunds. ** We will be launching from a cove just a few minutes away from our location. An email will be sent to you with the exact address when you register and pay. The Eclipse Extravaganza will be a fun family event with something for everyone. This regional park can accommodate a large number of people for viewing in a beautiful natural setting. At the Environmental Education Center, we will have total eclipse themed games, activities, exhibits and young scientists will enjoy our unique hands-on solar experiments. Our local NASA Solar System Ambassador Larry Metcalf will be on hand to help guide us through this amazing event. Larry will have video monitors displaying the eclipse, informative talks on interesting details of the eclipse, and experiments available for hands on learning! Free Solar Eclipse Glasses and Eclipse Snow Cones while supplies last!